Leon Trotsky is arriving today! He is arriving at 9am at Pier 8 from Cadiz. Our much persecuted comrade Leon Trotsky at will arrive in New York this morning at 9am aboard the Spanish vessel “Montserrat”. For at least the time of the war he will find a home here. Comrade Trotsky belongs to the internationally minded Russian Social Democrats. He is also an editor at the Russian Social Democratic Daily in Paris. He was persecuted by the Russian government throughout all of Europe and he finally found his last resort in the United States. The “New York Volkszeitung” is welcoming their courageous fellow combatant in the name of the internationally minded German-Speaking Socialists of the United States. At least one country that still is free of Csarism. United States the only refuge. The Russian Internationalist is giving credit to the “Volkszeitung” and the “German-Language Group”. And then he pointed out that all of Europe, no matter if part of the Entente or neutral, belonged to the area of influence of the Csar. 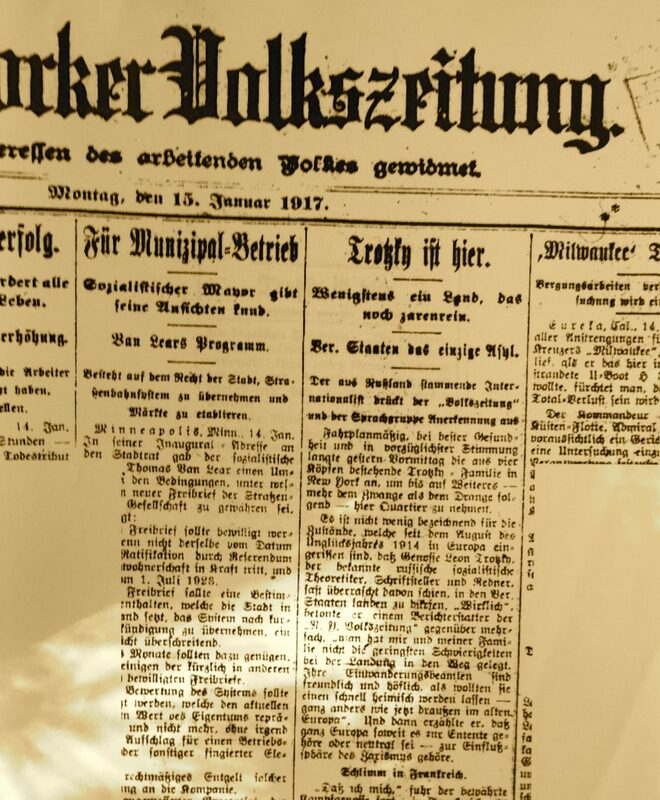 After, Trotsky gave friendly credit to the “Volkszeitung” and he explained that the paper is received in Europe as a reliable and accountable part of the Internationale. “I read the Volkszeitung every day in Paris as well as in Vienna and I do not want to let the opportunity pass to thank you for your loyal and brave attitude. Likewise, there are many European comrades who appreciate the high amount of socialist sense of duty and clear insight of the New Yorker voice of the German speaking socialist workers.” And then Trotsky cited several articles that he especially recalled. In relation to the above comrade Trotsky told in fluent German a little episode from Spain. As he was interrogated by the Spanish police prefect it turned out that this high official was unable to speak any other language than Spanish. A translator was called, a German who was supposed to translate the questions as well as the response. In addition it turned out that the translator was also the secretary of the German consul……”The nationalist defamation is truly international” added our comrade with a smile “and it uses the same dirty tricks everywhere”. What plans does our friend have for his future. ….The socialist movement in this country can only be thankful that the war sent this fellow combatant and teacher to its shores. And here’s the front page of the next morning’s Jewish Forward. 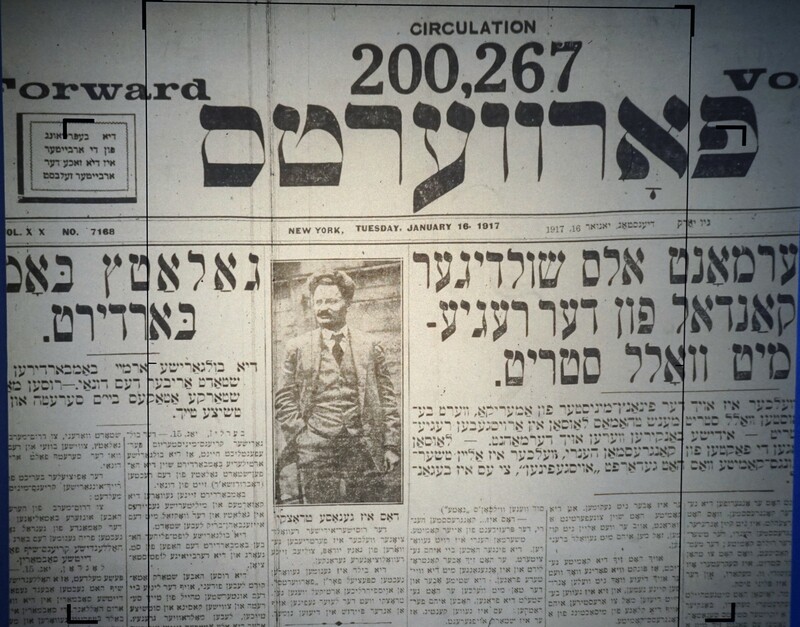 The Forward’s 200,267 circulation made it one of the most widely-ready daily newspapers in the city and country, competing even with the New York Times. The caption under Trotsky’s photo says “This is Comrade Trotsky” and introduces him as Russian revolutionary par excellence. The Forward would carry interviews with Trotsky for the next several days.